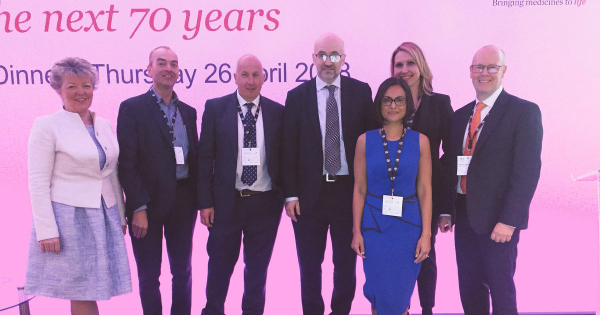 Last week a team of health and social care leaders from Greater Manchester showcased the city region’s progress and developments, as part of the Association of the British Pharmaceutical Industry (ABPI) national conference. The conference attracts the top executives and leads from across the UK’s pharmaceutical industry. Jon Rouse, Chief Officer of the Greater Manchester Health and Social Care Partnership and Ben Bridgewater, Chief Executive of Health Innovation Manchester, co-delivered a session about the difference devolution has made to improving the health and social care system, while also enabling the creation of Health Innovation Manchester to accelerate innovation into clinical practice. The strategic context was then complemented by two case studies on the GM COPD programme and the cancer vanguard programme. Martin Gibson, Chief Executive of NorthWest EHealth, Consultant Chest Physician Dr Binita Kane and Alison Mursell, Director of Devolved Health at GSK jointly delivered an overview of the GM COPD programme and how it has evolved from the ground-breaking Salford Lung Studies randomised controlled trial to the development of medicines optimisation guidelines, which will now be implemented as part of a broader more holistic improvement programme. Following that, Rob Duncombe, Director of Pharmacy at The Christie NHS Foundation Trust, was joined on stage by Anglea McFarlane, Market Development Director for IQVIA, to provide an overview of the cancer vanguard pharma challenge project, with the aim of leveraging industry and pharma experience, capability and funding to optimise cancer medication. The session culminated with all panellists taking part in a question and answer session, facilitated by broadcaster Jonathan Dimbleby. Once finished, the team were met with rapturous applause from the audience, with delegates sharing positive feedback directly and via social media. The conference further enhanced the memorandum of understanding Greater Manchester has in place with the ABPI, which has a shared ambition for Greater Manchester to be the safest and most effective place to receive medicines in the world. Several expressions of interest and offers of support have been generated from industry as a result of the conference and the social media activity on the day generated 14,600 impressions on Twitter alone.